8 GB Kit PC3-12800 CL1 ECC. FRU P/N 46C0517. We are able to source hard to find parts for Legacy systems through to the latest new in box parts for the latest generations of servers & storage systems. Any hard drives (if included) have been data wiped and work. Promote Your Server This 8GB PC3L-8500R IBM Server Module with a speed of 1066MHz and an 8533MB/s Peak Data Transfer rate. What Makes Us Different?. You will feel the speed of a quicker prefetch length which is double the DDR2 at 8 bits. The IBM part numbers are 00Y2479, 00Y2416 and 00MJ101. These are in excellent working condition. We will resolve the problem directly with you. The IBM part numbers are 49Y1397, 49Y1415 and 47J0136. These sticks are tested and in perfect working condition. We will resolve the problem directly with you. We are able to source hard to find parts for Legacy systems through to the latest new in box parts for the latest generations of servers & storage systems. PULLED FROM WORKING matching pairs. Main Details. Bandwidth is high in comparison to older DDR models, which allows the CPU to complete more tasks since more data is available. This improves the productivity of your server as a whole. Powerful data protection technology The ECC (error-correcting code) in this product protects your system from potential failures and crashes by automatically detecting and fixing data errors in your server. Lenovo 49Y1397. Component for: PC/server, Internal memory: 8 GB, Memory layout (modules x size): 1 x 8 GB, Internal memory type: DDR3, Memory clock speed: 1333 MHz, Memory form factor: 240-pin DIMM, CAS latency: 9, ECC. Upgrade Your Server This 8GB PC2-8500 IBM Server Module with a speed of 1066MHz and an 8533MB/s Peak Data Transfer rate. What Makes Us Different?. Dealz4TechUK is an independent distributor of computer hardware products for over a decade. We spot problems before they happen with the latest anti-fraud technology. It's safer, it's faster and it's everywhere. Ending Soon. we do not take any responsibilty after this. New Arrivals. QUICK LINKS. Desktop PC. PC Components. Why Choose Us! Audio Visual. Ending Soon. New Arrivals. QUICK LINKS. we do not take any responsibilty after this. Monitor & TV. Why Choose Us! The IBM part numbers are 46C0568, 46C0580 and 43X5318. These sticks have been tested and are in perfect working condition. We will resolve the problem directly with you. IBM 8GB RAM. PC3L-10600R 240 PIN ECC SERVER RAM. HP Server 8GB RAM Modules removed from HP servers. What sort of item are you buying?. Gazelle Close. IBM P/N - 44T1546. 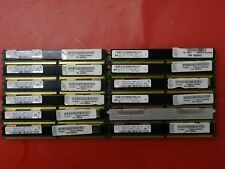 MICRON FOR IBM 32 GB (4 X 8GB) PC2-5300P DDR2 DIMM SERVER RAM. MICRON P/N - MT72HVQ1G72PY-667G1. This DDR3 provides more bandwidth than its DDR predecessor, which permits more data to reach your CPU and therefore increases the productivity of your system. Impressive data security The ECC (error-correcting code) in this product creates a fortified layer of protection against system crashes and failures. Dell PowerEdge R415. FRU 49Y1438, 47J0149, Dell P/N : A2626085, A2884828, A2884829, A3116517 A319. Dell PowerEdge R310. 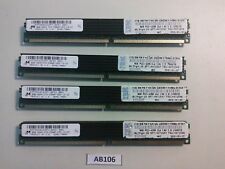 (4x 2GB) 2Rx8 PC3-10600R-0910-L0-D2, HP equiv 500202-061, 501533-001, 500656-B21. Refurbished IBM 8GB PC3-10600R DDR3 Ecc. Ending Soon. New Arrivals. QUICK LINKS. we do not take any responsibilty after this. Monitor & TV. Why Choose Us! Certification - We are ISO 9001:2008 & ISO 14001:2004 certified. here in the UK. 8GB 1x8GB Dual Rankx4 PC3-1060. P/N: 47J0157. FRU: 49Y1446. PART NUMBER: 47J0157. COMPONENT DENSITY: 8GB ( 1X8GB ). MANUFACTURER: IBM. Samsung Part Number: M393B1K70CH0-CH9. CAS LATENCY: CL9. COMPONENT RANK: 2RX4. IBM 8GB (1 8GB) 2RX4 PC3L-10600R DDR3-1333MHZ VLP ECC REG DIMM. We Accept Only. Ending Soon. New Arrivals. QUICK LINKS. we do not take any responsibilty after this. Why Choose Us! Audio Visual.